Scientists are worried about an invasive aquatic plant recently discovered in New Brunswick. An invasive aquatic plant that spreads even more when it's cut, chokes the life out of other plants and is harmful to fish has been discovered in New Brunswick waters. 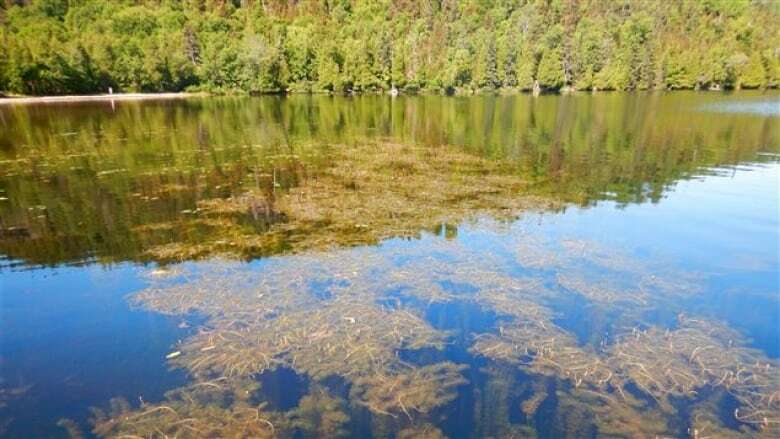 Eurasian water milfoil, one of the most noxious of the invasive plants in Canada, has been found in the St. John River, says Meghann Bruce, a research scientist with the Canadian Rivers Institute in Fredericton. "It can grow so fast and so dense the native species don't stand a chance," Bruce said in an interview. "This can consequently change the habitat and the function of the ecosystem, which has implications for sedimentation processes and water quality." 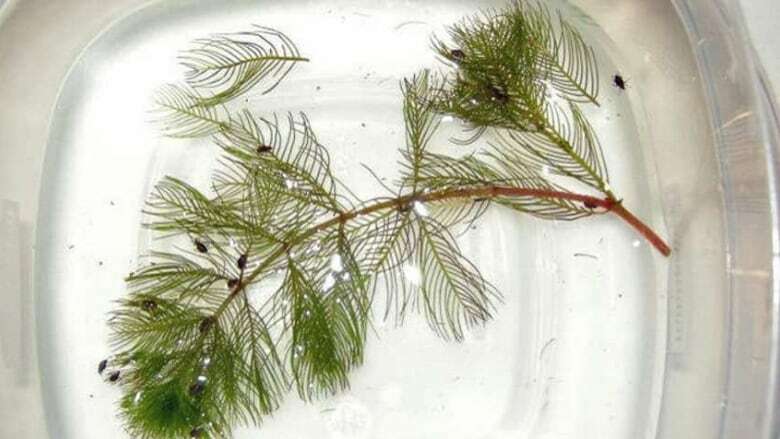 Eurasian water milfoil, which has green branches and red tips that are visible above the surface, is native to Europe, Asia and northern Africa. It has already been found in British Columbia, Ontario and Quebec waters, possibly introduced to the country through the aquarium trade or ship ballast, according to Ontario's invading species awareness program. "It has a broad environmental tolerance, so that's one of the things that makes it so successful at being an invasive species," Bruce said. "It's now found on every continent except for Antarctica." Bruce said the plant spreads rapidly and will multiply when it's cut by a boat propeller. According to the Ontario program, when native plants lose their battle against the invasive species, the oxygen levels in the water will decrease as they decompose, creating a threat to fish life. Although Eurasian water milfoil isn't dangerous to humans, it can hinder boats and compromise fishing grounds. It can also decrease property values on waterfronts where the plant grows, Bruce said. "It primarily reproduces by fragmentation … these pieces of the plant can break apart and create a fragment that goes to float downriver and start a new plant or it can hitchhike on other organisms or be introduced to water courses via people," she told Shift. Any change to the waterway is cause for concern. "What these exact impacts will be, we don't know yet," she said. "That's part of what our research is aimed at studying. We're trying to look at the potential impacts of this species." Bruce said rivers aren't considered a typical environment for the plant, which prefers slower-moving water such as lakes that are "calm with little disturbance." "In rivers it tends to stick to coves and inner-island, more sheltered habitats," she said. The plant's eradication is highly unlikely, she said. "It's not as simple as going and physically harvesting the plant to remove it," she said. "That actually breaks it up … and can cause further spread." Right now, she said, the priority is to prevent the plant from reaching other New Brunswick waterways and stopping its spread throughout the St. John River system. To do this, Bruce said, it's important for people to clean up their boat trailers and any other equipment along the water. People should also make sure they're not transporting any vegetation from one body of water to another, and they should avoid travel near the plant, since it can generate fragments. People should also avoid manually removing the plant. Anyone who comes into contact with the plant should contact the Canadian Rivers Institute at the University of New Brunswick in Fredericton.